From the big bang to the present, this “big picture” approach organizes the overarching development of humans into five critical turning points called waves – Communal, Agricultural, Urban, Modern, and Global. Illustrated, index, glossary, source notes, bibliography, and graphic organizers. Include puzzles, questions, and power point presentations. Each chapter includes "Questions to Consider" and "Insights," spurring critical thinking and "seeing" the information differently. This book is for educators, students grades 9-university, and adult learners. From the big bang to the present, this "big picture" holistic world history organizes the overarching development of humans into five major transformations or critical turning points called waves – Communal, Agricultural, Urban, Modern, and Global. Each wave is holistic, meaning that it has distinctive cultural patterns – currents – that reinforce each other. The five currents of human activity – ecosystem, techno-economic, social, political, and cultural – are repeated in each wave. 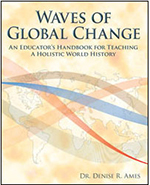 Praise for Waves of Global Change by educator Joan Brodsky Shur. She writes: So fantastically well-conceived and organized, beautifully written and "easy" for the student while in no way whatsoever talking down ... I feel your voice which is talking to me, which makes it lively and helps me to connect (as it would a student). It's conceptually so very rich…I love that you give multiple interpretations...the section on patriarchy is just so straight on and powerful. Throughout it's just so very well written. 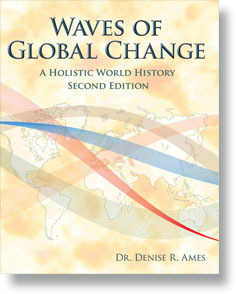 This chapter introduces the holistic approach used in this world history. It explains how the development of humans across time and space form the periodization framework. Human development is organized into five critical turning points or waves. It also outlines the system thinking and holistic approach used in this world history. The chapter examines the five worldviews—indigenous, modern, fundamentalist, globalized, and transformative—that informs our ways of thinking today. This chapter sets the "big picture" of our human history within our physical and biological history from the big bang through the evolution of our species. Woven into this chapter's narrative are five threads—interdependence, paradox, creative and destructive forces, change and continuity, and commonalities and diversity—that help create the universe, generate life on earth, and shape our human story. Examining our universal human behaviors, this chapter presents five comparative patterns or currents that form core human connections linking our past, present, and future. The currents are drawn from an interdisciplinary perspective and integrated within a historical framework. The five currents – Relationship to Nature: Ecosystem Currents; Ways of Living: Techno-Economic Currents; Human Networks: Social Currents; Establishing Order: Political Currents; and Human Expressions: Cultural Currents – each contain different content but are repeated in each wave. In the Communal Wave people gather/hunt or forage for food and live together in small communal, nomadic bands bound together through strong kinship ties. This wave encompasses the emergence of modern humans around 40,000 years ago and continues today with very small numbers still practicing, although in an altered form, a foraging way of life. 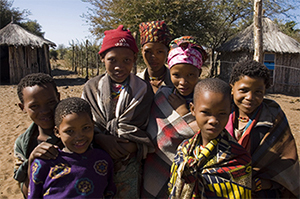 Also presented is a case study of the !Kung people in southwest Africa. With the Agricultural Wave people change from foraging for food to agricultural food production and a sedentary, village way of life. 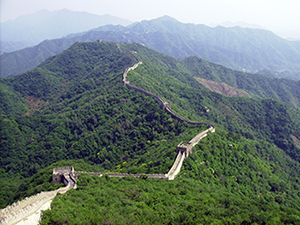 People begin to make this change in some, but not all, areas of the world beginning approximately 10,000 BCE. This transition also occurs at later time periods whenever a group begins to adopt an agricultural way of life. Some people today continue to live in small villages and retain some Agricultural Wave characteristics similar to earlier people. A section on chiefdoms and a case study of Cahokia is also included. During the Urban Wave, beginning in Mesopotamia around 3500 BCE, groups of people evolve out of sedentary agricultural villages to develop more populous and complex urban societies. This wave marks a transition to what we call civilization and all its accompanying characteristics. Some people in the world today continue to practice conventions that are characteristic of the Urban Wave, especially its religious traditions. A section on nomadic/pastoral people is also included. The Urban Wave is further examined in three historical periods: ancient, classical, and post-classical civilizations. The Modern Wave emerges around 1500 CE when some Western European countries rise to prominence, beginning with the conquest of the Western hemisphere and followed by interaction with and subjugation of societies throughout the world. Modern characteristics, shaped largely by Western Europeans, diffuse around the world after 1500. The Modern Wave is arranged into the early modern era, the modern industrial era, and the modern 20th century. The Global Wave is presently developing across the world. Humans in this wave create globally interconnected communication, transportation, financial, commercial, and trade networks and they use sophisticated technological innovations. The five worldviews—indigenous, modern, fundamentalist, globalized, and transformative—are further explained.